2 - Overly wet soil caused by too much rainfall or irrigation, which can cause the roots to begin rotting. Either way, it would be a good idea to test soil moisture, and maybe even test soil drainage in the planting area. To test soil moisture, dig down 4 to 6 inches in the soil beside the roots or the root ball and check the soil moisture. If the soil is wet, hold off on watering until the soil has dried some. If the soil doesn't dry within a couple days this could indicate a poorly drained soil. If the soil is dry provide more water. It is best to deep soak the soil less frequently than to splash a little water around plants every day. Note: After having planted new azaleas check soil moisture often and adjust watering schedule if necessary to keep the soil moist, not wet. If you've tested the soil moisture and held off on watering for a few days but the soil hasn't dried this indicates a soil drainage problem. If so, it's well worth taking the time to test the soil drainage. Start by digging a 12" wide by 12" deep hole in or very close to the planting area. Fill the hole with water and let it drain. After it drains, fill the hole with water again, but this time clock how long it takes to drain. In well-drained soil the water level will go down at a rate of about 1 inch an hour. A slower rate indicates poor draining soil resulting in constantly wet or boggy conditions. A faster rate, such as in loose, sandy soil, may signal potentially dry site conditions. Though they can tolerate brief periods of wet or dry soil caused by heavy rain or drought, azaleas perform their best over the long term in a consistently moist but well-drained soil. 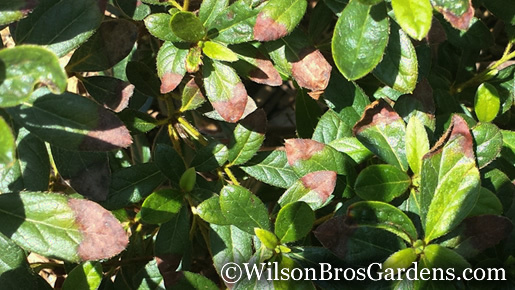 If the soil in the area where you planted your azaleas is poorly drained, meaning it stays constantly soggy or wet, for the sake of your plants and their long term health, you'll have to take measures to remedy the poor drainage conditions. 1 - Improve soil drainage in the planting area by lifting the plants and adding more native top soil to improve drainage, then replanting your azaleas. Note: With established azaleas it's best to wait until plants have gone dormant in winter to replant. Newly planted azaleas that have yet to root in can be lifted and replanted any time of year. 2 - Improve soil drainage by lifting and replanting each azalea in its own "raised mound." To create a raised mount simply mound native top soil. For best results the mound should be 24 to 36 inches wide and 12 inches high at the center and tapering gradually to the perimeter of the mounded area. Planting in a raised mound helps to keeps the roots of the plant above the water table while allowing them to grow down to and drink from it. If neither of these remedies are possible, and you want your azaleas to survive and thrive, it's best to relocate the azaleas to an area with well-drained soil and replace them with plants that are tolerant of wet soil conditions. 1. After having adjusted the watering schedule or improved drainage, to prevent spread of disease and to stimulate new growth, I suggest removing all the affected leaves from plants. If most of the leaves at the tips of stems are affected you can give the plant an all-over trimming, which also helps to stimulate root growth and new leaves. 2. Azaleas grow best in an acid to slightly acid soil ranging from 5.0 to 6.5 on the pH scale. Most average garden soils range between 6.0 to 7.0 on the pH scale.